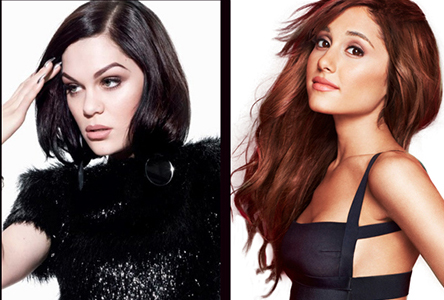 File this one under probably not a good idea but we'll reserve final judgment until we hear the finished song... Today, super-producer Rodney "Darkchild" Jenkins announced that Ariana Grande and Jessie J are working on a cover of Brandy and Monica's classic '90s R&B duet, "The Boy Is Mine," for his upcoming 20th-anniversary project. This will mark the second collaboration in the young careers of Ariana and Jessie, with the first being the explosive "Bang Bang," which landed on Jessie's most recent album, "Sweet Talker." As for the idea of this cover, as we said above, you never want to prematurely judge anything, but it's hard not to be skeptical, because of nothing else, the original might be just too great to duplicate. In addition to this cover, Darkchild also recruited Sam Smith for a cover of Whitney Houston's "It's Not Right, But It's Okay" for the upcoming album. This is one of several ways the music labels are trying to destroy black music. Just likem the TV show Glee singing black songs all while and borning. Did you see when they did Baby Got Back in a barber show harmony quartet?